For the Scottish footballer, see Jimmy Graham (footballer). 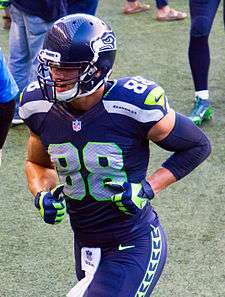 Jimmy Graham (born November 24, 1986) is an American football tight end for the Seattle Seahawks of the National Football League (NFL). He played only one year of college football at the University of Miami, after playing four years of basketball, and was drafted by the New Orleans Saints in the third round of the 2010 NFL Draft. In his second season in the NFL, Graham had 99 receptions for 1,310 yards and 11 touchdowns. That year he made his first Pro Bowl appearance and was selected as an All-Pro player at his position. He became the first tight end in Saints history to have more than 1,000 receiving yards in a season. Graham set the Saints franchise record for receptions in a season while also tying the Saints franchise record for touchdowns in a season (tied with Marques Colston and Joe Horn). Graham is also second all-time for most receiving yards and receiving touchdowns by a tight end in a single season. Born in Goldsboro, North Carolina, Graham had a difficult upbringing. At age 11, he was placed in a group home by his mother where he was physically beaten by older children. In high school, with help from a church youth counselor who took him in and eventually adopted him, he improved his grades, became a basketball star as a senior at Community Christian in Wilson, North Carolina and at Charis Prep in Wilson, North Carolina, and earned a basketball scholarship at Miami. Graham played basketball for the Miami Hurricanes men's basketball team from 2005 to 2009. Graham graduated from Miami in May 2009 with a double major in marketing and management, then stayed at Miami to take graduate classes while playing a season of football. He played tight end and finished the season with 17 receptions for 213 yards and five touchdowns. According to scouts, Graham was "extremely athletic, with an outstanding combination of size and speed for the tight end position," yet he was considered very raw since he only had one year of college football experience. Graham was drafted by the New Orleans Saints in the third round of the 2010 NFL Draft, with the 95th overall selection. He signed a four-year $2.445 million rookie contract on July 28, 2010. Graham with the New Orleans Saints in 2012. In his rookie season in 2010, Graham started in only 5 games, playing behind veteran tight end Jeremy Shockey, who also had played for Miami. In a Week 9 game at Carolina—his first NFL game in his home state—Graham caught a 19-yard pass to score his first NFL touchdown, contributing to a 34-3 Saints rout. Graham finished the 2010 season with 31 catches for 356 yards and 5 touchdowns. In 2011—his first full year as a starter—Graham had 99 receptions for 1,310 yards and 11 touchdowns and made his first Pro Bowl. He became the first tight end in Saints history to have more than 1,000 receiving yards in a season. He set the franchise record for receptions in a season while also tying the Saints franchise record for touchdowns in a season (Marques Colston in 2007, and Joe Horn in 2004, are the other receivers in Saints history with 11 touchdown catches). During the Saints' Week 17 win over the Carolina Panthers, Graham broke Kellen Winslow's NFL record of 1,290 receiving yards in a season by a tight end. However, the record was broken later that day by New England Patriots tight end Rob Gronkowski, who finished with 1,327 yards. In the divisional round playoff against the 49ers, Graham had a 4th-quarter 66 yard touchdown to give the Saints the lead, but the Saints ultimately lost 36-32 on a last-second 49ers touchdown pass. Graham was ranked 14th overall in the 2012 NFL Top 100 annual player poll, which ranks the 100 best players in the NFL based on votes from NFL players and coaches. He was left off the list in 2013, but on the 2014 list he was ranked 10th overall, the first tight end to make the top ten of this list. His 2012 season was productive, ending the year with 85 receptions for 982 yards and 9 touchdowns. Graham became known for his trademark touchdown celebration where he would slam dunk the football over the goalpost, a reference to his basketball background. During the 2013 season, he infamously bent the goalpost celebrating his touchdown against the Atlanta Falcons. Prior to the 2014 season, the NFL banned goalpost dunks and made it punishable as "unsportsmanlike conduct," which results in a penalty and a fine. Graham became the first player penalized under the new rule and was fined $30,000 for dunking during the preseason game against the Tennessee Titans in August 2014. Under the terms of the NFL's collective bargaining agreement, Graham became a free agent after the 2013 season. On February 28, 2014, it was reported that the Saints had placed a non-exclusive franchise tag on him, meaning that he would be allowed to negotiate and sign an offer sheet with another team; the Saints would then have the right to match that offer sheet and retain Graham, and if they did not, the other team would owe the Saints two first round draft picks. No such competing offer sheet was signed, but negotiations between Graham and the Saints were complicated by disagreement as to whether Graham should be treated for bargaining purposes as a tight end (his official position) or as a wide receiver (where he often lines up during games), since the difference in applicable compensation under the franchise tag is more than $5 million for the year. On July 2, 2014, an arbitrator ruled that Jimmy Graham was indeed a tight end for franchise tag purposes. Graham appealed the arbitrator's ruling to preserve his position while negotiations continued. On July 15, the last day for a new multiyear contract to be negotiated under league rules, the Saints and Graham agreed on a new 4-year deal with $21 million guaranteed and a total value of $40 million over 4 years, making Graham the highest-paid tight end in the league at the time. On March 10, 2015, Graham was traded to the Seattle Seahawks for center Max Unger and the Seahawks' first-round selection in the 2015 NFL draft. On November 29, 2015 Graham suffered a torn right patellar tendon. The next day on November 30, 2015, Graham was placed on the injury reserve. 1 2 John DeShazier, "New Orleans Saints tight end Jimmy Graham setting some lofty standards", Times-Picayune, December 4, 2011. 1 2 "New Orleans Saints individual records -- not including quarterback Drew Brees" Retrieved August 28, 2012. ↑ "Top Five Tight Ends in NFL History". Yahoo. ↑ Dave Joseph, "Jimmy Graham Felt Unwanted, Unloved, Hopeless, Until A . . . Savior Appeared", South Florida Sun-Sentinel, January 7, 2006. 1 2 Jason Cole, "TE prospect adept at overcoming obstacles", Yahoo! Sports, April 8, 2010. ↑ James Varney, "New Orleans Saints rookie Jimmy Graham appreciates life's lessons", Times-Picayune, May 17, 2010. ↑ "How to be a Saint". ESPN. August 29, 2014. ↑ Brett Martel, "Saints' rookie Graham grateful for life's lessons", AP reprinted at New Orleans Saints official website, May 14, 2010 (accessed November 8, 2010). ↑ "NFL Featured Prospect Profile", Retrieved August 27, 2012. ↑ Mike Triplett, "New Orleans Saints agree to terms with veteran quarterback Patrick Ramsey, rookie tight end Jimmy Graham", Times-Picayune, July 28, 2010. ↑ James Varney, "New Orleans Saints' Jimmy Graham scores first TD in return home", Times-Picayune, November 08, 2010. ↑ "Five New Orleans Saints named to Pro Bowl, including first-timers Jimmy Graham and Jermon Bushrod". The Times-Picayune. December 27, 2011. ↑ "Graham, Gronkowski go back and forth with tight end yardage mark". NBC Sports. January 1, 2012. ↑ Ted Lewis, "Peyton Manning No. 1 on list of NFL’s top 100 players", The Advocate, July 9, 2014. ↑ "Jimmy Graham bent the goalpost after scoring a touchdown". USA Today. November 21, 2013. ↑ "Video: Big Play Highlights — Graham wide-open TD". NFL. ↑ "What should Jimmy Graham's new touchdown celebration be?". The Times-Picayune. March 25, 2014. ↑ "Report: Saints TE Jimmy Graham fined $30K for goal post dunks". CBS Sports. August 22, 2014. ↑ "Jimmy Graham's touchdown celebrations cause rift with Sean Payton". The Times-Picayune. August 15, 2014. ↑ Patra, Kevin (March 1, 2014). "Saints slap Jimmy Graham with non-exclusive tag". NFL.com. Retrieved 2 March 2014. ↑ Vargas, Ramon (March 1, 2014). "Saints will hand franchise tag to Jimmy Graham before Monday deadline, he confirms". The Advocate. Retrieved 2014-03-02. ↑ Kevin Patra, "Jimmy Graham, Saints agree to 4-year, $40M contract", NFL.com, July 15, 2014. ↑ Patra, Kevin. "Saints, Seahawks agree to Jimmy Graham trade". NFL.com. Retrieved 10 March 2015. ↑ Farnsworth, Clare (March 10, 2015). "Max Unger exits as Seahawks make trade for Jimmy Graham". Seahawks.com. Retrieved March 10, 2015. ↑ "Graham out for season with torn patellar tendon". NFL.com. Retrieved 2015-12-02. 1 2 "Jinny Graham Stats". ESPN Internet Ventures. Retrieved 9 February 2015. Wikimedia Commons has media related to Jimmy Graham. "Jimmy Graham's Unlikely Path", ESPN video feature by Rachel Nichols, October 23, 2011.